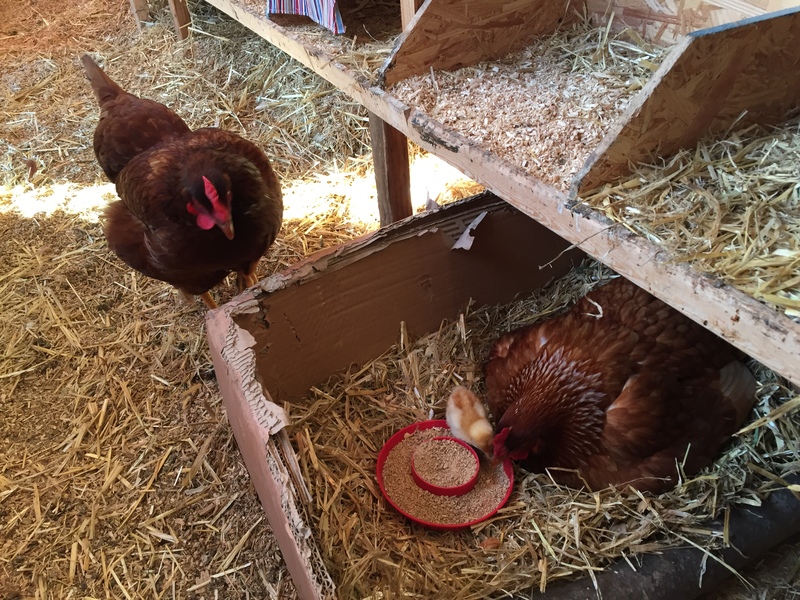 Today, as I watch Pip interact with the mother hen who hatched him, his actual biological mother approached the box to observe. Little Dude and I watched the scene play out with held breath, waiting to see how Madison would react to seeing a little chick in the box with Abby. Madison watched, too, stepping closer to look into the box and, at one point, jumping up on the edge of the box in her curiosity. Pip cheeped and ate and snuggled his momma, totally unaware that anything was happening behind him. Abby, however, was not, and although she did nothing to stop Pip from eating and playing in the outside world, was also watching. Ready to tell Pip to run for cover if the other bird decided to attack. But Madison just took one more look, hopped up in a box and went about the very important business of laying another egg. A few other girls came in after her, and there was the usual jostling for position in the favored boxes. Madison was soon disappointed because Dottie was in her favorite box. She even tried to fake the egg song in some weird attempt to get Dottie to leave and then pushed her way into the box, leaving me no choice but to relocate poor Dottie. Chickens are sometimes very strange creatures. And sometimes… they inspire me. Take Abby and little Pip, for example. They aren’t related by blood, but Abby loves her little chick very much. I can tell the way she calls to Pip, gently encouraging Pip to eat and play. Pip loves Abby. I’ve seen Pip ‘kissing’ his momma and nuzzling close to her neck and face. Sweet, heart warming interactions. It doesn’t matter to either of them that someone else laid the egg. Abby is the momma; Pip is the baby. There is no greater bond in our coop right now than theirs. This morning’s encounter has been on my mind a lot today. Mostly, I find myself thinking about how easy it is. Abby wanted to lay on eggs and hatch chicks. A natural animal instinct, you might say, and yeah, you’d be right. So I gave her some eggs. She laid on them for 21 days, and that’s how Pip was born. Pip is hers, not because she birthed his egg, but because she was the one who hatched him out and lets him sleep under her wing at night. She loves him. He loves her. So far, no one in the coop has complaint with this arrangement. If anyone them were to go broody, I’d give them whatever eggs were handy and no one would care which hen laid them. The babies would still get cared for. It’s just how chickens roll. In the human world, in this society, Abby would be ‘adopted mom’ or (given both Pip’s bio-parents live in the same flock) a ‘step-mom.’ In the human world, especially here in the United States, there is a growing mentality that no one except the bio-mom can give children love. Step mothers are told to back off, with hold affection, don’t help parent. They are expected to take care of only their kids and not help their mate with his. Because Bio-Mom (even a totally inept one) is better than step-mom. There is a ‘Mom’s Forum’ I frequent full of posts and rants which support this method of parenting. I don’t comment there often because I’ve long ago realized that I don’t buy into it. To me, love is love. Caring is caring. Concern and affection are concern and affection. Just because they come from a step-mom, or an adopted mom, doesn’t make them any less than love, caring, affection and concern. Actually, it makes them a little bit more… because it’s easy to just take care of your own kids. But to love someone else’s child as your own? That takes heart. And children, in my eyes, deserved to be loved by all the main adults in their lives. Not just the ones they share genetics with. Mom, Dad, Step-mom, step-dad, grandparents. Children deserve the love and affection, and deserve the ability to trust those adults with their lives. Much like little Pip looking up into Abby’s dark eyes and trusting that his ‘momma’ will keep him safe and warm. Because she is Momma and he is Pip. I agree with you. I also think that children always understand who really loves them and who might just be going through the motions because it is what society expects. Children are innately wise about such things. I just think it’s sad that some people would rather deny their kids one more source of love for their own selfish or insecure reasons than think of the child’s best interest. My parents were both married once before and they raised each others kids as their own. Dad wasn’t ‘step dad’ he as Dad, to all my siblings. We didn’t make that distinction. It didn’t matter. My older siblings are in their 50s now and it didn’t hurt us to have that love. But kids today are pushed and pulled and used as pawns in their parents games. Loving the step parent is seen as a betrayal and used against the child, too.